COMFORT ZONE. Double naturalprene thickness to protect your ribs. SILICONE TAPE. 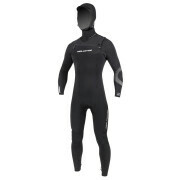 Prevents water from penetrating the wetsuit. GLUE & BLINDSTICHED. Provides high stretch, high strength, water sealed seams. EMBOSSED FLEX. More ergonomic construction behind knees and under arms for more comfort. POWER GRIP. Inspired by technologies coming from triathlon, POWER GRIP is a unique silicone coating that provides more resistance in the water when paddling, which means more efficiency and less effort. KNEE PADS. High stretched zone, high durability thanks to a specific fabric construction, high comfort. GLIDESKIN NECK SEAL. Prevents water from penetrating the wetsuit. MOTION PATTERN. Inspired by the triathlon?s wetsuits construction, allowing a completely free mobility of the shoulders, the motion pattern adapts this smart construction to our zipfree and front zip versions. Dedicated to performance and designed for cold water use thanks to its 4.3 Naturalprene stretch technology, our TOPOGRAPHIC wetsuit is the perfect crossover product for use in all destinations during fall and winter. Inspired from triathlon technology, we developed a specific stitch-free motion fit construction, improving the shoulders freedom of movement. We also developed a power grip technology creating friction with water and improved paddle power. This product is eco-friendly: made to perform and enjoy your ride.